That’s a disc. On the wire. March 10, 2012 / P.J. There are things that happen in this world where one has to question if it really could happen. 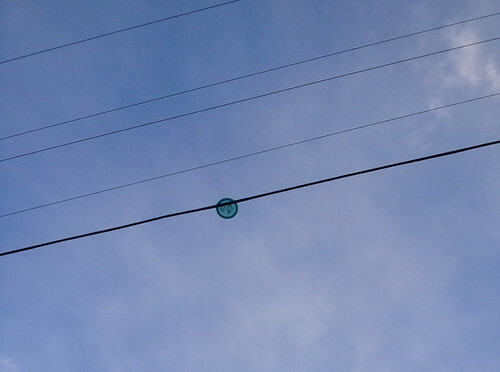 Kind of like if someone told you they got their disc stuck on a power line. Would you really believe it if someone told you that? Insert Kody O’Neill, who went out to play a casual round with his friends Salamen Butler, Levi WhiteEagle and Travis Duncan at Lake Bella Vista Course in Bella Vista, Arkansas. O’Neill said the course is pretty new and is a pro-level course. The beginning could have been a warning of what was to come as three discs were lost (water hazard throws) through the first five holes. “We made a joke coming around to hole 15 that we could not lose any more Frisbees,” O’Neill said. Then came hole No. 17, a par-4, 750-foot straight hole. O’Neill took out an Innova Tee Bird and said he threw it as far as he could. “It would have been a great throw, except the unexpected happened,” he said. The disc somehow split a cable and stuck. O’Neill said everybody went crazy when it happened because they saw it hit the power line and the disc never came down. WhiteEagle installs that kind of cable, O’Neill said, and explained that the disc was caught between the cable and strand that run together. The group tried hitting the disc down with other discs, but even when the Tee Bird got hit, it wouldn’t budge. To make matters worse? They had to walk away from that and head to hole 18 — a par-5 that runs 1,110 feet! IF you have a cool story you’d like to share, e-mail the e-mail address below! Let us know the story. Photos make it better! We’d love to share crazy and zany disc golf tales! Was the 2 meter rule in effect? I have done this one time before on Hole #18 at the Pyramids Disc Golf Course in Leicester, MA during a practice round. There was a wire that extended across the fairway on the hyzer-line. 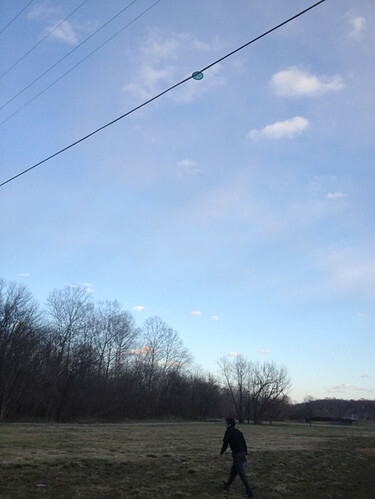 I threw the Spike Hyzer Shot that split the wire as well and the Disc wedged right in there. To make matters worse, it was also above the 2-meter mark so it was deemed Out-of-bound but fortunately it was just during a practice round and I eventually got my Disc back!! You know how tight those cables are bound together? That disc was hauling some serious snap!